The president of the Central African Republic voiced optimism Tuesday that the latest peace accord would succeed in the conflict-torn country after he moved to form an inclusive government. 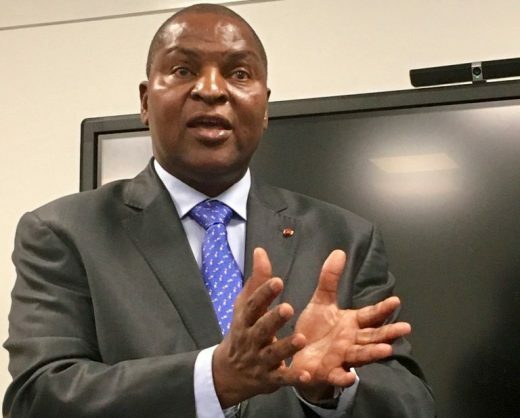 On a visit to Washington, President Faustin-Archange Touadera said that the agreement — the eighth peace attempt in six years — addressed the crucial issues of power-sharing and accounting for human rights abuses. “It’s not inevitable, but we think that this could be the final agreement if we all work resolutely in putting it into place,” he said at the US Institute of Peace. “This agreement has something more than the other ones as all the stakeholders had time to discuss all its key points,” he said. The resource-rich country has been torn by violence and displacement since 2013 when a mainly Muslim rebel group known as the Seleka overthrew president Francois Bozize, a Christian, triggering the rise of a predominantly Christian militia. Fearing a Rwandan-style genocide, former colonial ruler France intervened militarily under a UN mandate. Touadera’s elected government in February signed an accord in Sudan with 14 armed groups — which control most of the country — and a month later all sides reached a deal on forming an inclusive government. But the accord has since faced setbacks with rebel groups squabbling over how much power they will have in the government. But Touadera said the agreement had settled the larger questions, including some fighters’ insistence that they not face prosecution for violence. “It’s true that there were difficult moments in the negotiations, notably on the question of impunity — giving an amnesty — and on power-sharing,” he said. “But I think that in respecting the parameters, all sides have realized that we cannot have peace while setting aside the issue of justice,” he said. Touadera is set to meet in Washington with Secretary of State Mike Pompeo and hopes to encourage US investment in the impoverished country. Western powers, notably France, have been looking with alarm at the growing influence in the country of Russia which has sent military trainers with murky ties to mining companies. Touadera defended the Russian involvement, saying it was carried out openly with the UN Security Council granting an exemption from its arms embargo on the country. “There’s room for everyone in the Central African Republic,” he said.